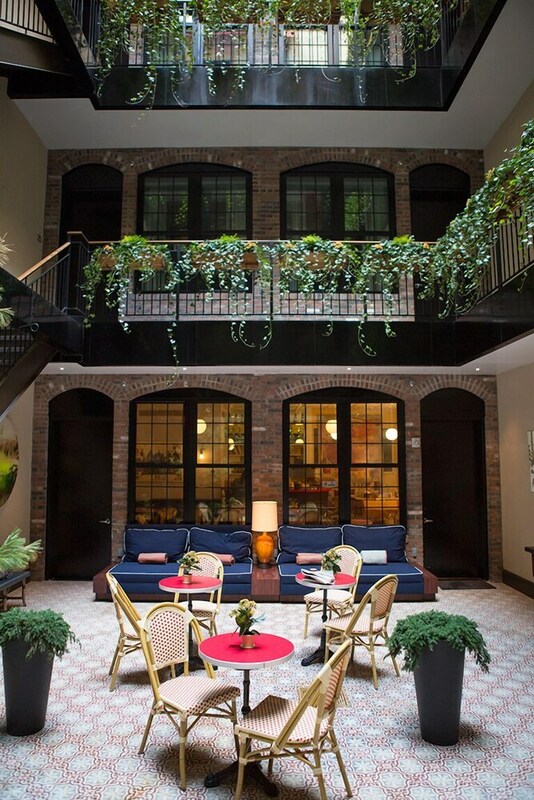 This boutique hotel is truly a gem amidst the hustle and bustle of Soho. My room was lovely, and incredibly quiet. It was a treat having Eduardo prepare our breakfast each morning. I felt like I was in a Parisian cafe, with the decor and the courtyard outside. The location is superb -- right in the heart of shopping and dining. I'll definitely be returning! Frequent NYC visitor for work and pleasure. Just discovered this gem! It's small, quaint, beautiful, and quiet. Staff is great. Rooms are nice and tall ceilings make it spacious. Breakfast cafe with made to order breakfast a bonus! I had such a nice time staying here for a couple of days. Everything was clean and comfortable and the staff super friendly. Full of personal touches and charm, plus an excellent location. I’ll be back! Rooms are great. Service always great from front desk, to room service to morning breakfast. We love the location and that it is a simple door off Broome Street. You step out into crazy sometimes and back in to peace and beauty. We were upgraded to the top penthouse the last time we stayed and were spoiled. It had a fantastic bathrooom and large terrace. It felt like home. Very friendly and caring. Great location and close to many restaurants and shopping in SoHo. Great breakfast. Very different from the huge and rather anonymous big hotels. A place to come back to. I spent a few nights in the Pent House of The Broome in February. It's such a pleasure to find a hotel where you are greeted by name and recognized each time you walk through the door. The Pent House has an incredible balcony which is well lit at night and includes heaters so that you can enjoy it any time of year. My room was very clean and I enjoyed everything about this stay. Thank you for making it so wonderful. Loved my stay here. The staff were warm and welcoming, the hotel clean and very comfortable, and the complimentary breakfast was yummy. Feels like a little European hotel with wonderful attention to detail. Will definitely return and recommend highly to friends. The Broome is a very small boutique hotel hidden away in Soho. It is absolutely beautiful! They make you feel like it is a very personalized visit. The room is small but all amenities provided as well as a great breakfast in the morning in the cute little cafe. Highly recommend! I stayed 5 nights in The Broome. It is in a great area just off broadway near Bloomingdales so lots to do and see. The hotel itself is very much a boutique...relatively small, no room service, small dining room and no bar. I was in town for business so it wasn't ideal (as I needed desk, room service and ironing done) but for a weekend it would be perfect. Located in SoHo, THE BROOME NYC is within a mile (2 km) of popular sights such as New York University and 5th Avenue. This 14-room, 4-star hotel has free breakfast, free in-room WiFi, and a conference center. Free continental breakfast is included with your stay and awaits you each morning from 7 AM to 10 AM. Get a pick-me-up at the coffee shop/café. A flat-screen TV comes with cable channels and pay movies, and guests can stay connected with free WiFi. Beds sport premium bedding and the bathroom offers a hair dryer and designer toiletries. Other standard amenities include a minibar, free newspapers, and free bottled water. Dating back to 1825, THE BROOME NYC offers a conference center, free newspapers, and laundry facilities. The front desk is staffed 24/7 to help with dry cleaning/laundry, luggage storage, and securing valuables. Free continental breakfast is served daily from 7 AM to 10 AM. This property requires a non-refundable deposit equal to the full cost of stay for all "Advance Purchase" rate plans. This deposit is due at time of booking the reservation. To complete the reservation process and obtain additional information, please contact the office using the information on the reservation confirmation received after booking.